Two of my prints have been selected for this exhibition: 'Pipe Dream'​ etching & Aquatint and 'Puginistic Emboss' a blind embossing made by running a printing plate through a printing press with out the ink on it but still dampening your paper. 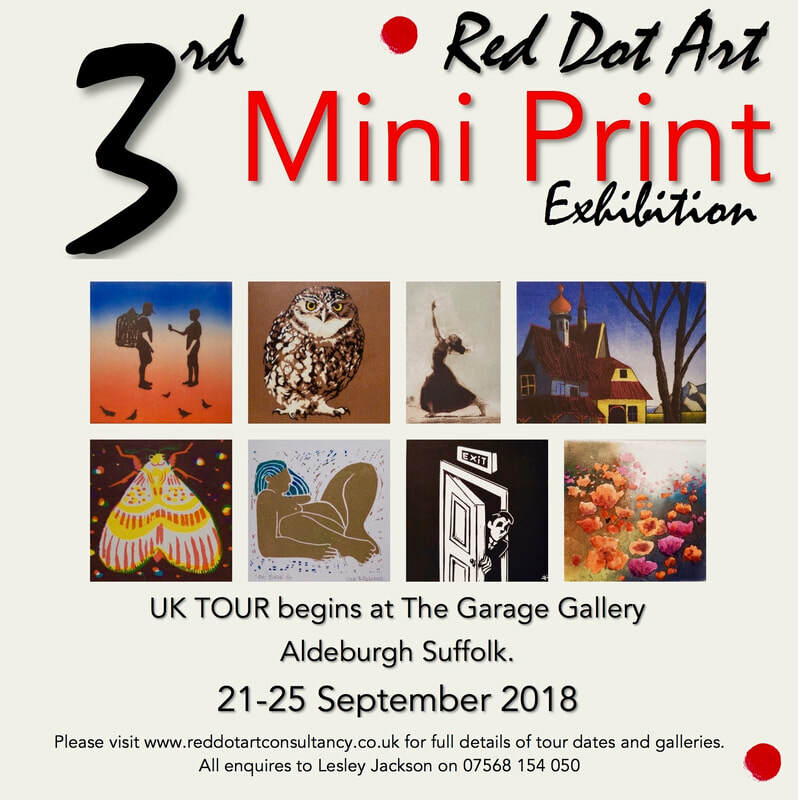 Exhibition Showcasing the best of East Anglian Art. Wells Maltings, Staithe Street, Wells-next-the-sea, NR23 1AN. Open 10.00 am - 6.00 pm daily. 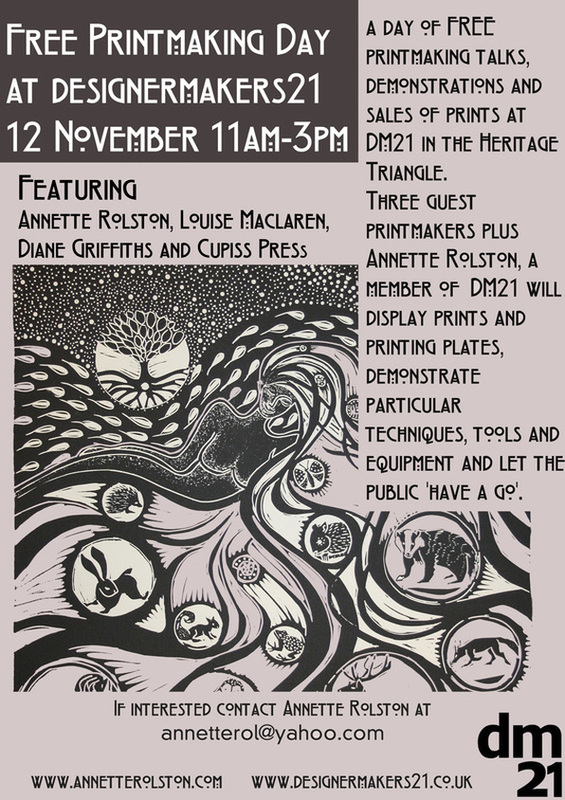 An Exhibition of Etching and Intaglio Work by Norfolk Based Artists organised by Print to the people. In association with the wonderful Hahnemuhle papers. 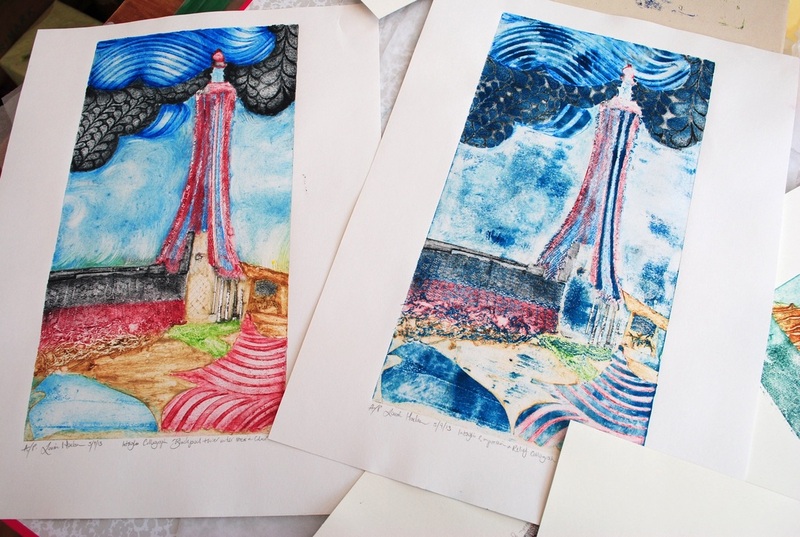 Have you ever made a Collagraph Print? 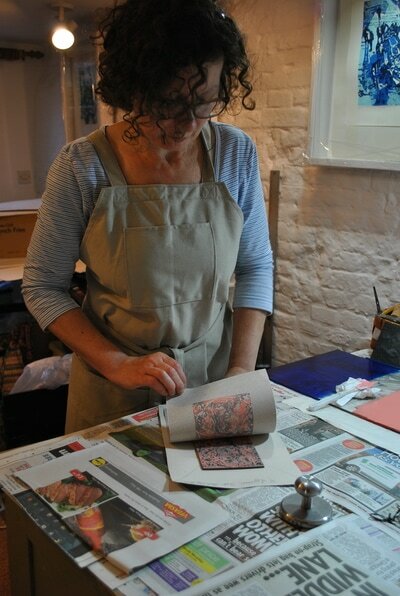 Collagraph comes from the Greek word Koll or Kolla meaning the glue and graph which means to draw. It is like Collage in that you create an image by sticking on your chosen materials. The main difference between a Collagraph and a Collage is that you use the finished Collage as a Collagraph printing plate. You force ink into the texture on the plate, then Remove the excess. 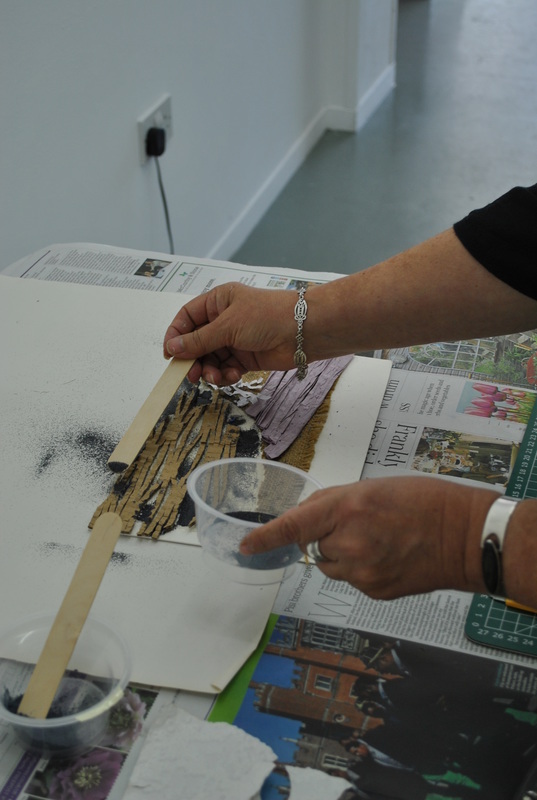 The final stage involves damp paper being 'lined up' or 'registered' with your collagraph plate and run through a traditional Roller Press or by working a Slama Hand Press over your paper & plate. 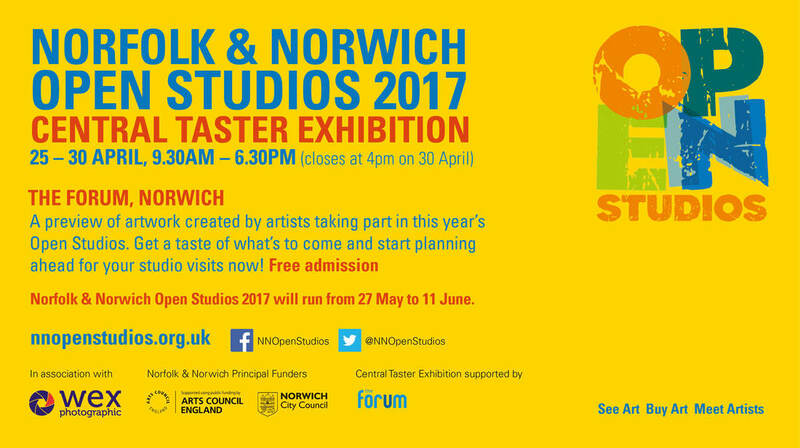 Central Taster Exhibition at the Forum, MILLENNIUM plane, Norwich. 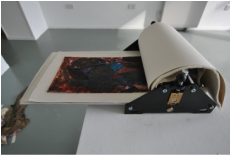 I will be demonstrating both intaglio and relief printmaking techniques with the Slama Handpress​. This includes Drypoint and Linocut printing all by hand, with blocks made and designed by myself. I shall be there on Wednesday the 26th of April from 10.00am until 12.30pm. Featured Artists will be exhibiting their work and demonstrating many different printmaking techniques. Visitors will be encouraged to 'have a go'! 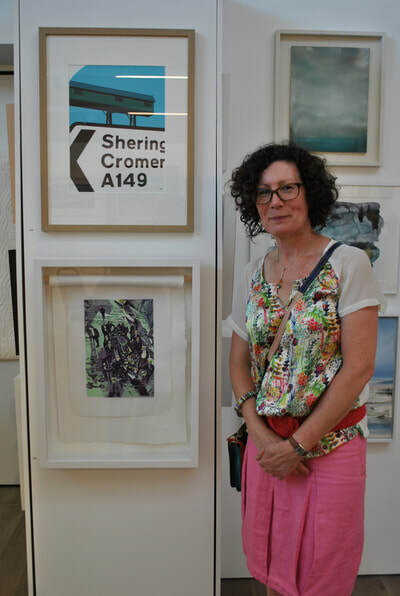 Louise Maclaren's 3 Block linocut prints from Cley 15 Contempory Art Exhibition's 'Marvelous in Ordinary' are to be shown in Cromer in May. Louise presented one of her limited edition linocut prints to the Sheringham Shantymen during August 2015. It now hangs in the home of the Shantymen; Oddfellows Hall, Sheringham, Norfolk, UK. 'And with Music they bring light' a limited edition linocut by Louise Maclaren, June 2015. 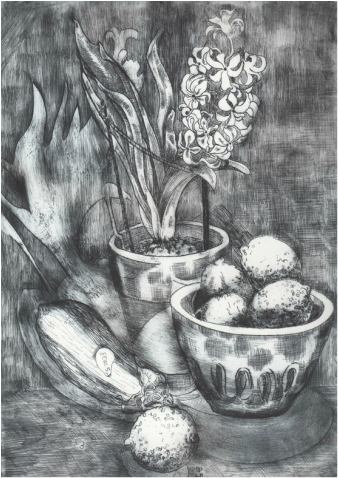 'Still life in Shadow' by Louise Maclaren 2014. Limited edition Drypoint Print. 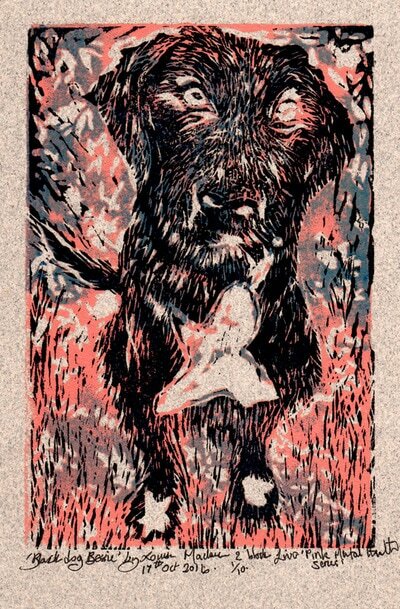 I will be doing more workshops on printmaking during 2016 at various venues throughout Norfolk. Please feel free to contact me about future dates or check my events on the website news page. Inspirations for work and Collagraph plates with final intaglio prints 2013. Pressed leaves, flowers, string, fabrics wall papers and most soft textured materials can be used on a plate, provided it is not likely to damage the press. Printing plates were made by from card and a variety of collage materials. They are then inked up and 'wiped off. ​ Paper is also soaked before printing. Plates are layered on felt blankets and paper and then run through the press. Collagraph plates look beautiful and produce some interesting prints without much outlay provided you have access to a press. There are many art centers, schools and even printmakers who allow people to use their facilities. See my links for information. Good Luck with your move & your future life together! The Chair and Still life in shadow. 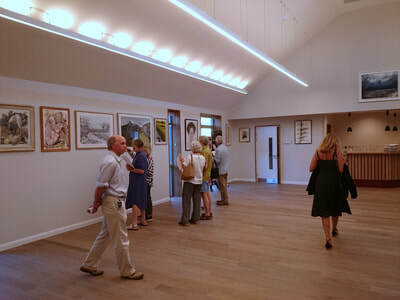 Cley 15's Contemporary Art Exhibiti﻿on: Marvellous in Ordinary. I exhibited three of my twenty seven, three block, caustic etched, Limited edition Linocut relief prints on scrolls of hand embossed paper exhibited in the church during July 2015. The work is called 'And with music, they bring light'. Inspired by a photograph I took of a local sea shanty band from Norfolk: 'The Sheringham Shantymen'. On one of our coastal walks into Sheringham we came across them on a slipway standing around a fishing boat, some of them dispersing. In my work they represent some of the lost and dying industries here in Norfolk such as; the fishing industry. Clearly the shantymen have a strong connection to their immediate locality, the sea and the fishing industry; they are almost lovingingly standing around that boat. 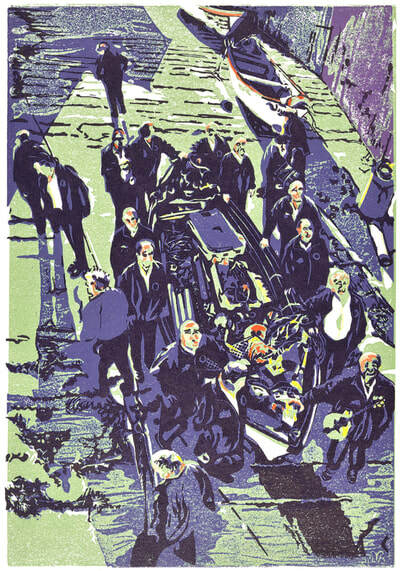 I was so warmed by that sense of community and place they exuded, coupled with the extraordinary scene of them standing on the slipway on a bright september day contrasted with long shadows, that I immediately wanted to immortalize it a series of handmade prints. The Idea of the paper came from trying to source authentic local materials as much a s humanly possible. Seeing that the paper making industry here in Norfolk had become extinct like the printing industry here near Fakenham, I did some research. I found that Taverham had been a very productive Papermill after it had had several types of milling industries in it before the paper took over and was first recorded to be in existence in 1701. It has quite a history and was used in Producing the University Press at Cambridge, The Oxford English Dictionary, Bank of England Banknotes and the Times News paper. Two other extinct paper mills are also represented in the work: Lyng which was closely associated with Taverham and also Thetford Paper Mill for its famous Pulpware. I decided to try and use other English made papers to represent the mills. I chose Somerset Paper from St Cuthbert's Mill, Somerset: Wookey Hole Cotton Rag Paper, from Wookey Hole Mill, Somerset and lastly an Italian paper; Fabriano because of its wonderful qualities for embossing and also the fact that there were no more surviving english mills that I could find easily. I hand carved the Stamps in linocut from images associated with these Mills. 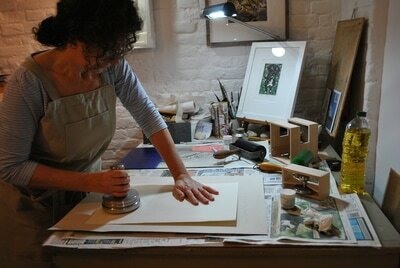 I then used them to emboss the paper, which was then rolled to display the prints and represent the Mills. Some of my work was published in a stunning book; 'The Artful Hare' by Alan D Marshall 2015. It contains a real cornucopia of hares made by printmakers. To Buy a copy you can email me: paperinkprint@gmail.com or direct from the publisher Mascot Media, mentioning my name with your purchase please!